A 2� internal width system for high profile, aesthetic applications where a barrier is required to separate wet and dry areas. DIN 19580 does not cover grates for 2� (50mm) internal width trench drains, but grates have been load tested in accordance with DIN 19580 guidelines. 2� internal width trench system - meter (39.37�) channels. �U� shaped bottom improves flow hydraulics. 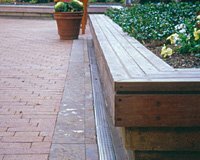 Choice of grates in various materials and styles (including ADA compliant) for applications from Load Class A to Load Class C.
Integrally cast-in galvanized steel edge rail provides additional strength and protects the channel edge from damage. (Stainless steel edge rail also available). 1.5� Sch. 40 drill-out allows vertical evacuation at male end of channel at any point along the run. Call 800-277-5015 to place your order for Mini Klassic!